New enrolments commencing from 8/5/18 to 22/6/18 will receive 4 weeks care at a special low introductory rate of $65 a day on regular booked days. The special introductory rate ceases regardless of the amount of weeks the child has attended the centre on 29/06/18. All enrolments on the 2/07/18 will return to the regular daily fee. The introductory offer must be mentioned at time of enrolment for redemption. The offer is only valid to new enrolments, the offer cannot be used where the child has attended one of our services in the past six months. To receive the offer before enrolment commencement the bond & registration fee must be paid with a completed direct debit agreement. The offer will void if account in arrears. *Two days free given after four weeks of attendance. 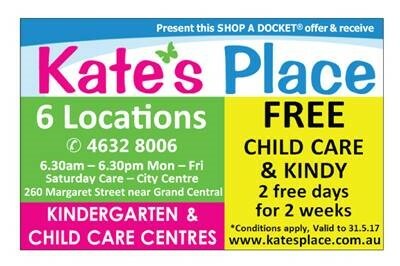 Free days are redeemable towards child care fees only. No money refunds. Offer void if account in arrears. The voucher cannot be used where the child has attended one of our services in the past six months. Currently enrolled families - be rewarded a Family Cinema Pass (2 adults & 2 children) for referring a new successful enrolment. *Offer conditions: Newly enrolled family must attend minimum of 8 weeks before loyalty reward can be claimed. Additionally child must not have attended the centre before and referral must be notified at the time of the new enrolment. Limited to one family pass per new family enrolment (not per child).